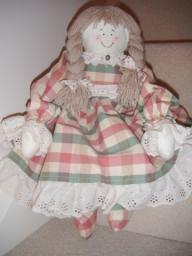 This little cutie is a medium ragdoll and has blonde plaited wool 'hair'. Her dress is purple and white gingham. She had Broderie Anglaise bloomers, purple 'sprig' patterned shoes and lavender lace details. [link:rag20:Made-to-order] rag dolls also available. 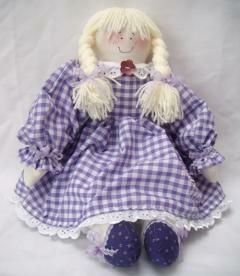 Handcrafted ragdolls, each one completely unique, in a pretty selection of fabrics, trimmings and accessories.